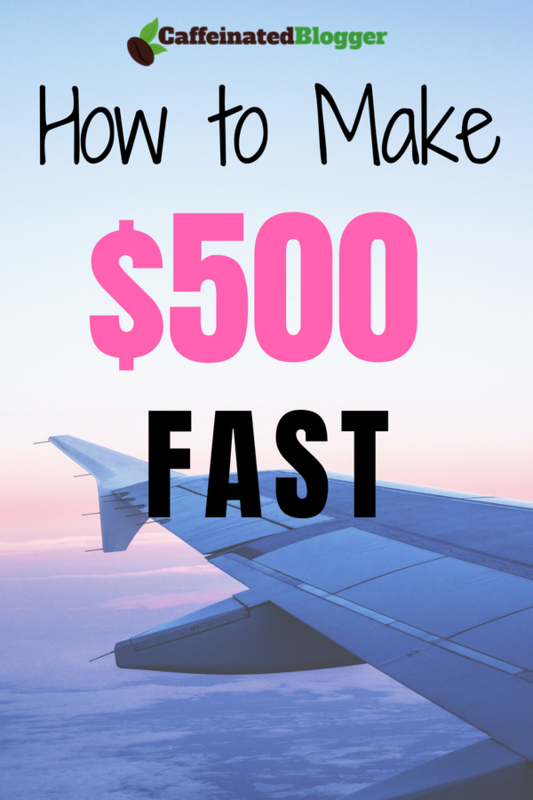 Want to know how to make 500 dollars fast? Yep, it's very doable, you just need to know how to do it. Did you have a surprise bill arrive in the email or an unexpected expense? You need money and you need it now. Making money when you need it is not always easy, but it is possible. While you will not simply be handed $500 when you want it, it is easy to find small tasks to help you supplement your income, bringing in some extra funds when you need them. There are endless websites out there that advertise quick ways to make money, but who can you trust? Here are the top five websites that will show you how to make 500 dollars fast, working from home. Microworkers.com is a marketplace that offers micro jobs. “Micro jobs” are tasks that only take a few minutes to complete. There are no special skills required to do these jobs and you should be able to complete them regardless of where you are in the world. The more you are on this site, the more jobs will be available to you. Once you begin working for an employer, you will be better-known, have reviews to back up your reliability, and even the experience to make these jobs even easier and faster for you to complete. Simple jobs: These are the most basic type of online jobs. It can be as simple as making a post on social media, joining a social media group, or even just making an email account. The payout is not going to be a lot, but the jobs also do not take much of your time. HG jobs: HG stands for “hire group.” A hire group is made up of chosen employees of specific employers, making essentially a team that is known to be reliable. The better reputation on the site, the more likely you are to nab a HG job. You will need to be on the website for a while to establish a good reputation. At first, it might seem like there are not a lot of jobs available to you, but the more small tasks you complete, the more work options you will have to choose from. One of the bigger downsides for some workers on Microworkers is that you need to make at least $50 in order to withdraw your pay. So, Microworkers is our #1 recommendation for anyone trying to find out how to make 500 dollars fast. Let’s move down the list, there are more excellent options. MTurk.com is another marketplace that offers small jobs for workers all over the world, and is a great option for anyone who wants to make 500 dollars fast. Owned by Amazon, MTurk allows you to sort the available tasks to find jobs that are in the pay scale that you are looking for. The jobs can be as simple as taking an online survey, transcribing audio, or even just supplying opinions on current events. Employers like using MTurk to fill in needs that cannot be met by their everyday workers or certain types of work, benefitting both them as employers and you as a worker. The jobs list the amount you will earn as well as an estimate for how long the job will take to complete. As you progress and do more jobs, users have reported making between $6 and $10 per hour, which is more than minimum and average hourly wages in different places around the world. Some of the jobs have qualifications required in order to apply to do them. These qualifications can be earned by working smaller tasks. The more jobs you do, the more jobs there will be available to you to choose from. None of the jobs require any kind of skills as they are usually just supplying your personal opinions or personal information about your shopping habits. They might time some of your time, but really require little effort in order to complete them. Some of the tasks will require you to be in the United States, but there are still plenty others that should be available to anyone, anywhere in the world. Clickworker.com is a well-established marketplace that has been around since 2005. Clickworker allows for workers anywhere in the world to apply for the digital tasks available, allowing you to make up to $9 or $10 an hour, depending on the task, making it realistic that you can earn a good amount of money in a single day. The majority of the jobs that are available on Clickworker are going to be text-based, which means a lot of writing, editing, and translation work, but there are also other types of tasks available. Because the pay is better on Clickworker than on some other site, the quality of work is more important than other websites. This means you need to have a completed and thorough profile, acting like a professional resume to explain your skills and qualifications. It will go over your language proficiency, interests, education, and even other jobs that you have worked before. The sign up process with Clickworker is not instant like other websites and can take anywhere from 24 to 48 hours to allow you to see what jobs are available for you to work. Then, you will see assessments that you will need to complete to show your proficiency to potential employers. Once you have completed assessments, you will have more qualifications in your profile and the amount of jobs you can apply for will go up. So it could take you several days to be able to work for Clickworker, but since the payout is much higher than other websites, it should be worth the wait. Ok, ready for more? 🙂 Here’s how to make 500 dollars fast with 2 more sites. ShortTask.com works by connecting freelancers (called “solvers”) with employers (called “seekers”). Research: Research tasks include looking up data, facts, finding prices, looking at competitors, and essentially anything that might require a few minutes of your time. People who work on the internet most of the time are usually excellent at finding the needed answers. Data Entry: Data entry can mean a lot of things, including putting in data or numbers, filling in Excel spreadsheets, collecting data from websites, and even just copying and pasting some information from one doc to another. Writing: Since this is ShortTask, writing jobs are not usually going to be anything extensive, but could include writing an article, editing, reviewing, or even simply writing a comment on a post or product. A good amount of the writing tasks involve using a variety of social media accounts as well, finding, liking, sharing, or commenting on a variety of posts. Design: Designing in this area does require some background of design and programs like Photoshop. Designing is usually smaller tasks, like logos, banners, or headers for websites, but it could also mean web design in a bigger sense. On ShortTask, you only need to make $10 before you can have the money transferred to your PayPal, which is less than some of the other job marketplaces you could use. Since the withdrawal limit is so low, it’s a great site for anyone who needs to make $500 fast. Founded in 2010, JobBoy.com is run by a team of three people, unlike many of the other marketplaces that are online. As result, there might be fewer results, but the trustworthiness of the site itself is higher. It functions the same as the other marketplace sites, helping connect online workers to employers. The types of jobs that you will find on JobBoy can vary from small writing jobs to jobs that relate to posting on social media, none of which should take you too long to complete. The more jobs you do with JobBoy, the higher of a success rating you will receive. Some of the jobs on the site will not allow you to apply for them without the minimum required success rate. This is to ensure that the more dedicated employers are receiving quality workers who will follow through on the jobs. Just like an office job, the more you work and the better quality you give, the more opportunities you will have for better jobs. Employers have up to 48 hours to accept or reject your application, so you might not find out instantly if you won a job. You also need to submit proof of your work to the employer, which the employer has to approve before the money can be distributed to your JobBoy account. This might not work out for workers who are just trying to add in some income in their free time and bring in money quickly. Just like ShortTask, you can withdraw your earnings once they have reached the minimum of $10. 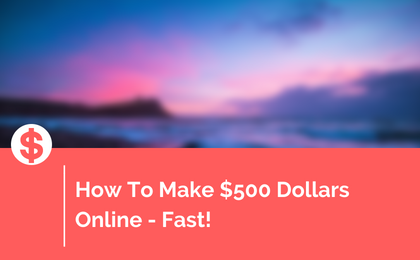 Ok so now you know the list of websites which we recommend if you would like to know how to make $500 fast. But you’re probably wondering, realistically, how long it might take you to make the $500 that you need. Firstly, you should register at all of these websites, because each one of them might only have a limited number of jobs and you might not be able to fill your whole day with the available jobs. Then, we have to make some assumptions. Assuming you get around $8 per hour for the tasks (which is realistic if you work fast), you should be able to make the 500 dollars in about 62.5 hours of work. If you need to raise the money fast, and you work around 10 hours a day, you should be able to do it in approximately 6 days. (Of course this is not guaranteed at all, this is all based on the assumptions I mentioned earlier). So basically it means that this could be perfect for anyone wanting to know how to make 500 a week. This could also be great for anyone who wants to know how to make an extra 500 a month – if you spread out these 60 hours over the course of a month, that’s only approximately 15 extra hours per week that you’d need to spend on these sites and it may bring you an extra $500. Well, this is it! This is our roundup showing exactly how to make 500 dollars fast. Be careful using marketplaces that have not been around as long as other websites, as you run the risk of being roped into a scam, doing work for free. While none of the marketplaces will get you $500 for free, you should be able to complete these small tasks using little of your time, supplementing your income and helping you pay off any expenses that may have arisen unexpectedly. With a little bit of work, you will be able to make $500 in no time at all. 3 replies to "How To Make 500 Dollars Fast: Ultimate Guide"
I am a continuous visitor of your blog and a big fan of you, I have a question all these jobs are only for the US, UK only or for all worlds please clarify.